Extremely picturesque with its many beautiful islands, bays, and points, Fish Trap Lake is both a photographer and fisherman’s dream. 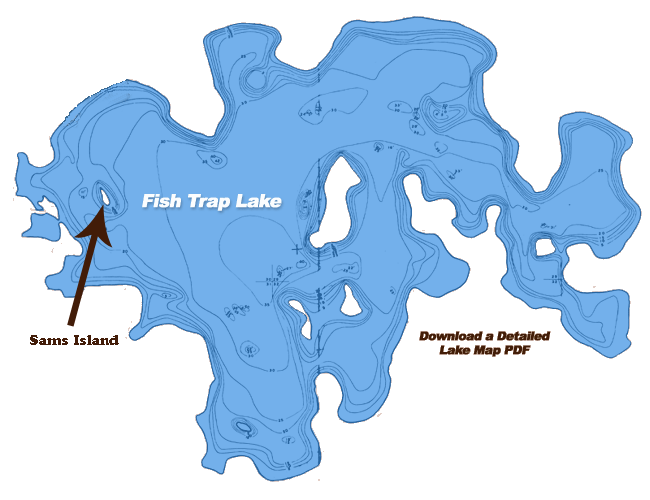 Bald eagles, loons, and great blue herons make this lake their home as do schools of walleye, northern pike, large mouth bass, crappie, and other pan fish. Fish Trap has 13.7 miles of shoreline and 1303 acres of recreational pleasure. The lake offers a variety of challenging structure with steep shoreline breaks, sunken islands, rocky flats and a 10ft to14ft weed line. The deepest point is 42 ft with a median depth of 23 ft.